I execute the covering process and got a notification "Coverage analysis aborted. Displaying results of the previous run." 10:15:41.486 |V| RealizedAssemblyItemUnification| Final release for realization of assembly “dotCover.Shell, Version=3.0.0.0, Culture=neutral, PublicKeyToken=1010a0d8d6380325”, deleting file at C:\Users\snh\AppData\Local\Temp\AppDomainBase\Giqubev\dotCover.Shell.3.0.0.0.EF737B1C\dotCover.Shell.exe. 10:15:41.486 |V| RealizedAssemblyItemUnification| Unrealizing assembly item “dotCover.Shell, Version=3.0.0.0, Culture=neutral, PublicKeyToken=1010a0d8d6380325” file C:\Users\snh\AppData\Local\Temp\AppDomainBase\Giqubev\dotCover.Shell.3.0.0.0.EF737B1C\dotCover.Shell.exe. 10:15:41.487 |V| RealizedAssemblyItemUnification| Cannot delete the file C:\Users\snh\AppData\Local\Temp\AppDomainBase\Giqubev\dotCover.Shell.3.0.0.0.EF737B1C\dotCover.Shell.exe in skip mode. Access denied to C:\Users\snh\AppData\Local\Temp\AppDomainBase\Giqubev\dotCover.Shell.3.0.0.0.EF737B1C\dotCover.Shell.exe. 10:15:41.490 |V| RealizedAssemblyItemUnification| >> (Closing) AppDomain assembly resolver based on assembly unification data in appdomain IsolatedBuildRunnerEngine. 10:15:41.497 |I| IsolatedBuildGuest | Ended build stage. 14:40:03.248: Thread:1: EXCEPTION: Eine Ausnahme vom Typ "JetBrains.dotCover.WorkspaceHost.Workspace.SnapshotToWorkspaceProxyFactory+NoActiveSnapshotException" wurde ausgelöst. Eine Ausnahme vom Typ "JetBrains.dotCover.WorkspaceHost.Workspace.SnapshotToWorkspaceProxyFactory+NoActiveSnapshotException" wurde ausgelöst. ---> JetBrains.dotCover.WorkspaceHost.Workspace.SnapshotToWorkspaceProxyFactory+NoActiveSnapshotException: Eine Ausnahme vom Typ "JetBrains.dotCover.WorkspaceHost.Workspace.SnapshotToWorkspaceProxyFactory+NoActiveSnapshotException" wurde ausgelöst. Could you please try to empty the 'Temp' folder? If the 'AppDomainBase' folder (C:\Users\snh\AppData\Local\Temp\AppDomainBase\) can't be removed for some reason, please reboot the machine. Could you please also tell us what problems you had with dotCover 3.0? 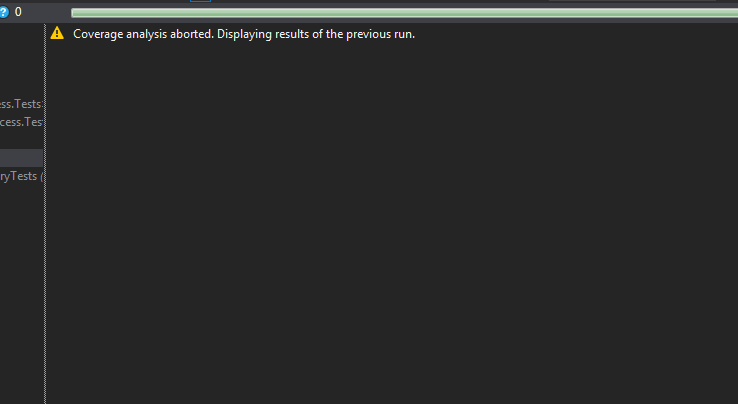 Starting with version 3.0 dotCover has relocated under the ReSharper menu (ReSharper | Cover). Do you see it there? dotCover 3.0 is not compatible with ReSharper 8.2.x, so this version of ReSharper has to be removed from Visual Studio (if you choose Visual Studio integration). Sorry for the inconvenience. Could you please send us or attach here log files? To get logs, please empty the '%Temp%/JetLogs' folder and launch Visual Studio with the following command line parameter: /ReSharper.LogFile. Could you please clear the 'Include not loaded solution assemblies into coverage results' check box on the 'dotCover General' page of the 'Options' dialog box (ReSharper | Options | dotCover | General) and try again? Yes, its working now. Thanks for that. Though, it solved the problem, I didn't understand it. Can you please describe the solution. If 'Include not loaded solution assemblies into coverage results' option is switched off dotCover includes to the coverage report only those assemblies that were loaded during the execution of unit tests. This means that if some of your projects is not covered with unit tests at all, it won't be included to the report. If 'Include not loaded solution assemblies into coverage results' option is switched on all solution projects are included to the coverage report. This is a new feature of dotCover 3.0 (previous dotCover versions behaved as if the option was switched off). Unfortunately there is a bug in this new feature: dotCover fails to check that all assemblies corresponding to the solution projects exist. For example if there is a project that has never been built yet coverage analysis will end up with the error. I have created a corresponding issue in our tracker: https://youtrack.jetbrains.com/issue/DCVR-7258. I'm extremely sorry for the inconvenience. Please feel free to contact us if you have any questions or if it doesn't seem to be your case.